Facebook mafia games such as Crime City and the very popular RPG game, Mafia Wars by Zynga are popular a popular theme on the site. Criminal Empire follows this game genre but blends city building into the mix as you complete quests, and grow your organization. You’ll fight other crime families that try to take your buildings from you. The game features city building elements such as homes, businesses, and decorative items for your city. Expand your growing city with new districts and make more money. To expand and have more structures you’ll need authority points. Take contracts at your docks and other areas for income. In Criminal Empire, you need “authority.” You can get more of this by building structures and expanding your criminal organization. This works the same way as other games where you need “happiness” in your city. Other ways you can make authority is with gangster structures. These include parking lots, parks, a hideout, and other special buildings. Businesses and other building also increase your authority levels. So for example, with a simple bar you can gain +25 authority points in the game. Criminal Empire features a unique energy system called gangsters. Since this is a crime game, it’s a nice addition. Every time you perform actions such as collecting money, you’ll use up gangsters. When thugs or other gangs try to take over your structures, you’ll use gangsters here in a shootout. It is the same energy style system but it adds to the game. Use gangsters to collect items around the map in crates, boats and other places for collection rewards. The game also features a nice quest system with a bit of a story. You’ll face off against many different gangs in the game and your secretary will interrupt your game play to give you new quests to keep the story moving along. Quests will help you level up and you’ll get rewards such as coins for completing them. The quests fit nicely into the game and they don’t feel random like similar games. Besides the crime elements, you also have plenty of nice structures for your city. You’ll find homes and businesses to build as well as the criminal buildings with all structures adding to your authority points. You’ll find the typical decorative items such as roads, signs, trees and similar items. 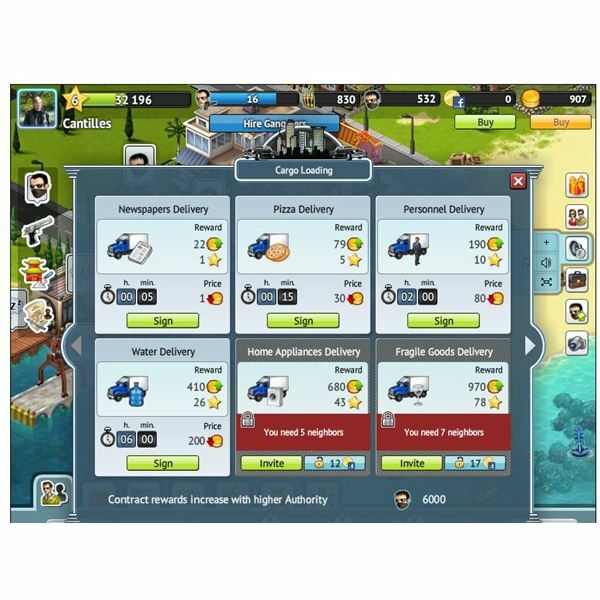 The building content isn’t as extensive as other Facebook city builders are, but it’s enough to keep you busy with your city construction efforts. As you defeat various gangs, you can even build special districts, which give you a huge amount of authority over the city. You’ll make money in the game by using special buildings to fulfill contracts. Find these buildings throughout the big city and you’ll unlock more contract buildings as you play. The first buildings are located on the dock. You can take many contracts such as an ore shipment, glass shipment, diving tour, or hotel taxi. As you add Facebook friends to your game, you’ll unlock new contracts with higher payouts. Criminal Empire has good graphics for a Facebook game. The different districts are run down and as you gain more you can remove the junk buildings and put up your own. Each structure has some nice detail but the game could use some more structure variety. The soundtrack has a nice bluesy feel to it and when you play, you’ll hear some different sound effects such as gunfire when you attack other gangs trying to take over your structures. The popups over each building can clutter the screen some as you play but overall the graphics are good. The game even has a full-screen mode. When you visit Facebook friends, you can help them remove gangs from their structures for coins and it will increase your mafia rating but it’s unclear what the mafia rating in the game actually does. The game also features the typical gift giving which is a staple of gaming on Facebook. With city builders, you don’t get many multiplayer options. Criminal Empire goes beyond the typical city builder and gives you some crime elements. It’s fun to construct buildings and try to boot out the other crime families. As you build, you can unlock new areas of the city. The quests are a nice addition with a bit of a story besides just random building. This game is recommended it you like city games but want some different game play elements. 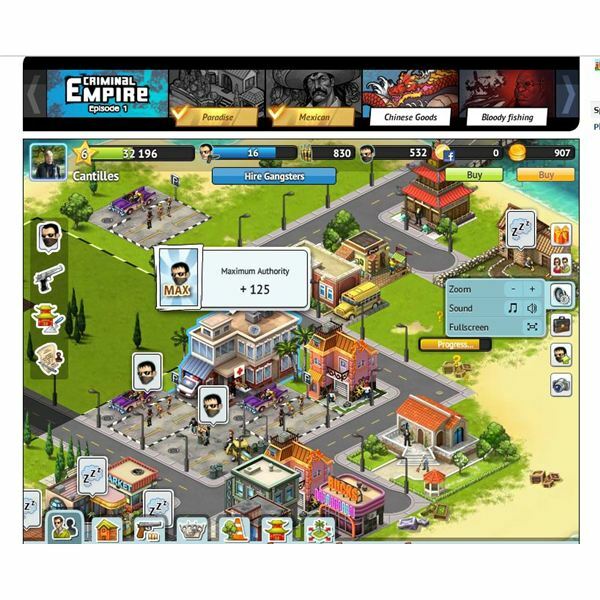 Criminal Empire delivers and could become a great game on Facebook with more content. All images from Criminal Empire. Source: Article is author's own experiences playing Criminal Empire on Facebook.